ORLANDO — The general assembly of the Disciples of Christ has voted to affirm open homosexuals and transsexuals as members and leaders. The resolution was passed this week in Orlando with the support of a number of representatives within the denomination, including Midway Hills Christian Church in Dallas, Texas; Foothills Christian Church in Wichita, Kansas; Bethany Christian Church in Gastonia, North Carolina and St. Andrew Christian Church in Berkeley, California. The GLAD (Gay, Lesbian and Affirming Disciples) Alliance was also a part of the move. 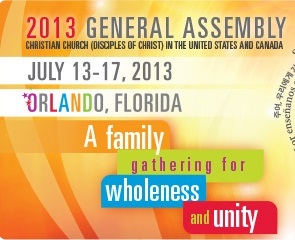 “[B]e it resolved that the General Assembly meeting in Orlando, Florida, July 13-17, 2013, calls upon the Christian Church (Disciples of Christ) to recognize itself as striving to become a people of grace and welcome to all God’s children though differing in race, gender, age, sexual orientation, gender identity, nationality, ethnicity, marital status, physical or mental ability, political stance or theological perspective,” the resolution states. She states, however, that no particular church within the denomination is required to change its policies if it disagrees. And there are likely those who will choose to distance themselves from the resolution. For years, the denomination has been split on whether or not to embrace homosexuality as an accepted behavior. Apologist Matt Slick of Carm–who is not affiliated with the denomination–outlined a similar viewpoint in an article about homosexuality posted on his website. He stated that telling others that homosexuality is in opposition to God’s creation order is not hateful.